San Francisco is such a great food city, but one that I really haven’t gotten the chance to explore all that much. 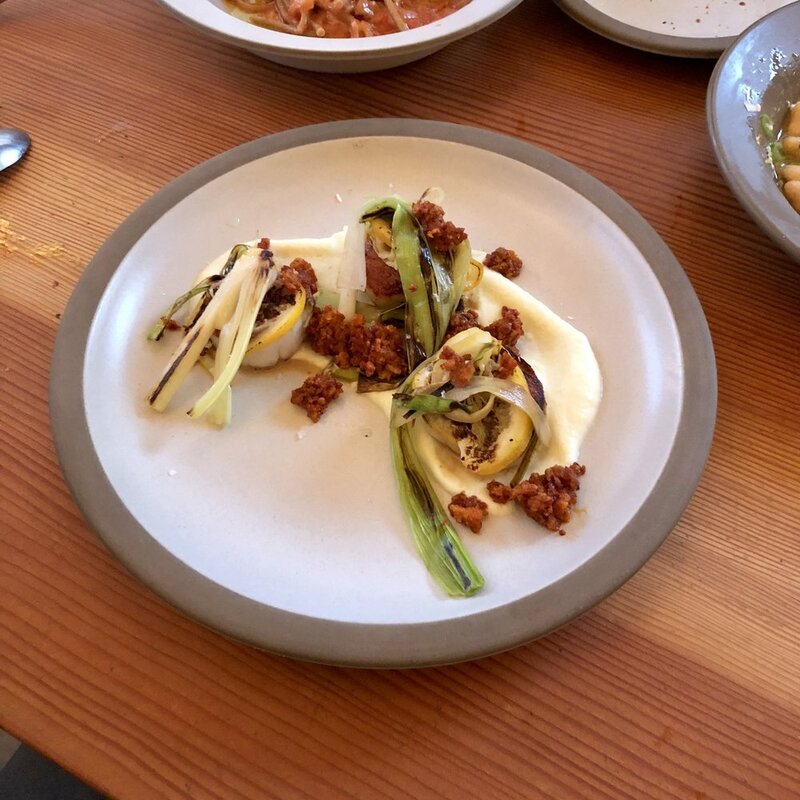 A few months ago when I was spending a night there before heading out to wine country, I made it a top priority to make dinner reservations at Tartine Manufactory. You’ve probably heard of Tartine Bakery before, or at least drooled over their tasty looking baked goods on Instagram, but did you know they also have a chic restaurant in a bright, industrial space in the Mission District? I’d been following them for a while, and practically every dish I see is calling my name. The menu draws from local, seasonal California ingredients, and of course offers some killer pasta and bread. There’s a huge bakery in the restaurant, and I can only imagine how many fresh loaves of sourdough they’re churning out each day (check out all those proofing baskets stacked up below!). It’s worth having a glass of wine at the bar and just watching the entire process unfold. Serious bakers are practically my idols! PS- if you’re looking to get into baking yourself, I highly suggest you start out with the critically acclaimed Tartine Bread book. It’s full of foolproof classics that are sure to satisfy your cravings. Getting back to our meal, it did not disappoint in the least. We tried a bunch of dishes (as evidenced by scrolling through the slideshow above), and while it would be easy to say the bread was the highlight of the meal, that really wouldn’t do the rest of the food justice. The lamb meatballs were delicately spiced and served with a deliciously creamy, yet earthy fava bean purée. One of my faves was the marinated artichoke with fennel and pistachio- such a unique dish, and a total flavor explosion. The slightly sweet, caramelized fennel paired perfectly with the hearty pistachio spread. Yum! Most people would agree that once you’ve tried homemade pasta it’s hard to go back, and Tartine’s pasta will really do you in. Classically simple, non-fussy, and perfectly al dente! Of course my favorite part of any meal is dessert, so I naturally (greedily?) chose the one that serves 2-4 people! Although it was not my first time devouring the PB&J ice cream pie, it was just as decadently tasty as I remembered. Seriously, the peanut caramel and peanut cookie crust take this treat to another level entirely. Don’t forget to stop by the ice cream counter on your way out for a cone to-go, and definitely take a freshly baked loaf of bread for to enjoy at home! Good news for those in Los Angeles- you don’t have to drive eight hours to enjoy all that Tartine has to offer- a Southern Cali outpost is opening soon!